For years and years there'd been rumours, hints, speculation. Every few months the local paper would suggest that A Posh Retailer might be interested in the Civic Centre site, or the old Co-op store on Carr Street, or even the Mint Quarter. Even when they said the deal was done -- especially when they said the deal was done -- you couldn't quite believe it. 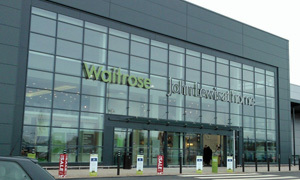 Then, all in the space of a few months, we had not just one but two branches of Waitrose. Ipswich is now firmly on Miranda's mum's map. Big out-of-town site opened mid-November and the car parks were reportedly crazy busy, men in hi-vis vests using hi-voltage cattle prods to guide the maddening crowds. Now been open two months and hopefully a bit quieter for our official visit. Me driving, a rarity, and we grabbed a Clearasilled spot next to a mahoosive mound of snow. Past the minimal downstairs grab-a-coffee area, ignore John Lewis (he's at home) and upstairs to the grander cafe, a world away from the Rendezvous down the road. Dozen or so people in the queue. It'll be fine. Andy doubles back to secure a ready made sandwich, plus smoothie, and also orders a mocha and cake! Finding about the only free table, Andy's sitting pretty with his array of foodstuffs. That's why they pay him the big bucks. Me, I'm slowly sipping my Shaken Udder banana milkshake. Thankfully it's tasty. Ten minutes later, his sarnie long gone and me still food-less, I decide to rejoin the queue for coffee and cake. After a bit, Andy appears to tell me that my toastie has arrived. I can't give up my place now and hang on for another five mins for hot beverage and sweet stuff. Meanwhile my plate of formerly hot food (and undressed leaves) is rapidly cooling, and turns out to be unremarkable. What a farce. Girl at the till told Andy that everything's OK until lunchtime. You don't say. Yet the punters are out in force and neither pitchforks nor flaming torches are visible. Smile and put up with it. Cakes are great, by the way. Waitrose: the clue's in the first syllable. If it was a car -- Brian Rix. If they were passing by -- Lexus CT.